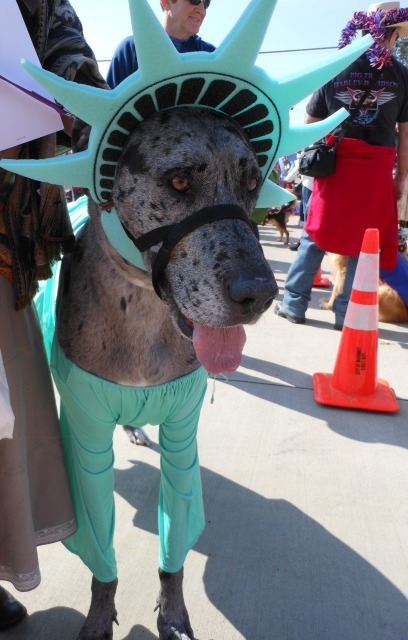 One thing’s for sure – the people of McKinney sure do love their dogs. And they extend that love to visitors who love their dogs, too. 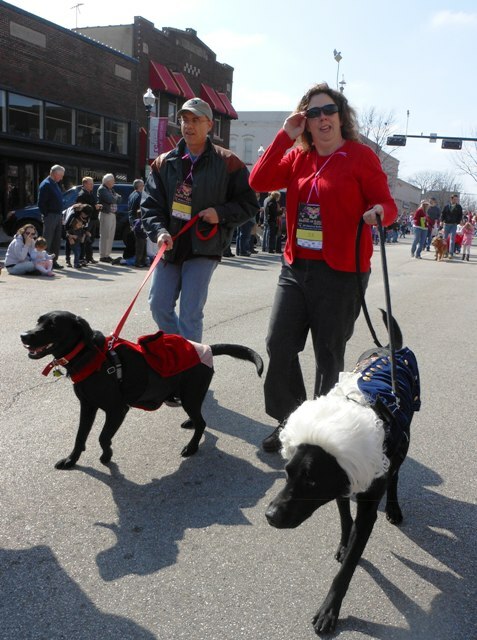 People and their pups saw no better example of McKinney’s love for dogs than this past weekend at the annual Krewe of Barkus dog parade in downtown McKinney. 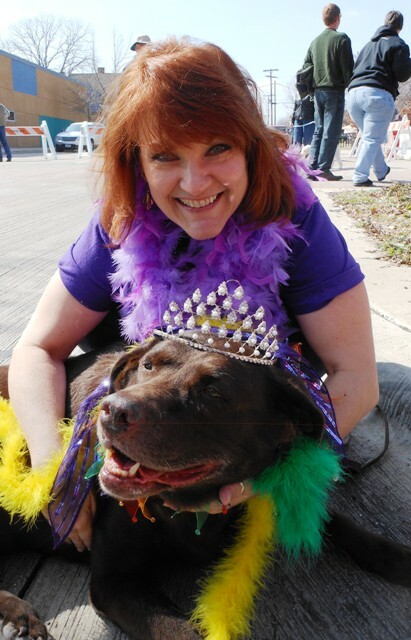 The event in 2012 was the 10th year for the Art Institute of McKinney (AIM) to put on this Mardi Gras celebration, organized by McKinney artists and Louisiana natives Blynda Christian (pictured at left with her dog, the parade grand marshal Lady Godiva) and Amanda Kelly. Parade entrants threw candy and Mardi Gras beads to many of the 3,500 or so spectators while some even threw mini-dog treats to the couple hundred or more dogs who were just there enjoying the outing with their owners. Bowls of water sat on the sidewalk outside many stores sporting signs “Dogs Welcome – People, Too!” signs in their windows as many of the parade attendees and their pets lingered around the square, enjoying the beautiful warm day and blue skies. After dispersing all the prizes, Blynda announced next year’s theme and date, expressing hopes for another glorious, unseasonably-warm February day. “Mardi Gras falls early next year, on February 12, so our parade will be on Feb. 10. That’s pretty early and it’s been pretty cold a couple of years, so everyone start praying now for another day like today,” she said. She then challenged participating dogs and families to start thinking about comic books, cartoons, superheroes and the like for a very animated Krewe of Barkus 2013. That should be a really good one – we can’t wait! Visitors or residents looking for a fun way to spend an hour or two of relaxed fun may want to head north of University/380 to Myers Park. It’s a beautiful area of our county just on the northern edge of McKinney with rolling hills, open spaces, and plenty of parking. Bring along a picnic lunch to enjoy with the family near the shores of the pond at the park, or opt for snacks at the concession stand inside the arena with its packed-dirt floors. 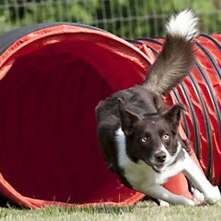 Dog lovers will get a kick out of watching small and large breeds alike running (or sometimes walking, as dogs newer to the sport sometimes do) through the courses as fast as their little legs can carry them. Jack Russell terriers, border collies, labs, retrievers and even chihuahuas seem to be especially well-suited to these types of competitions, but other breeds can surprise you. Even a low-to-the-ground dachshund can finish in good time! Basset hounds might be a little different story, being typically a little slower than most when it comes to running, but they are not entirely strangers to the dog agility arena. After the races, some dog owners even treat their pooches to a doggy massage (a massage therapist is often on-hand at these events) or buy them a new toy or treat from the doggie-oriented vendors set up at the event. Like many cities, the parks and neighborhood sidewalks are filled with people taking their dog s for daily exercise. This holds true for McKinney as well. The historic downtown square is especially dog-friendly with several shops, an art gallery or two, and the sidewalk dining areas of some of the eateries welcoming dogs. Some of the business owners even bring their pups to work with them. If you stop in at Stone Wood Creators, make sure to scratch the ear of Tom Lavy’s pup, Tater. 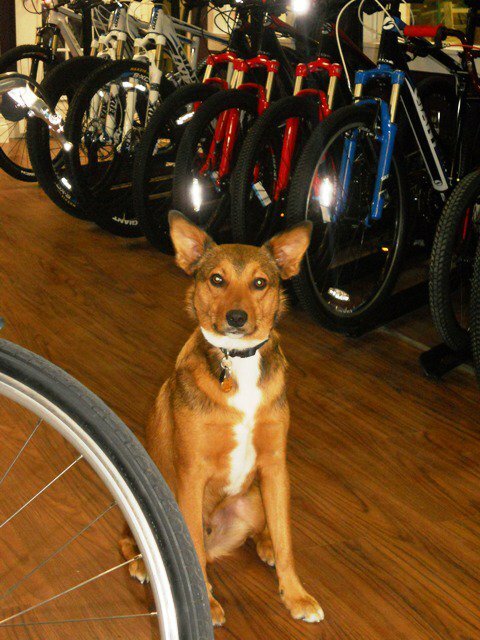 Or if handling bicycling business at Cadence Cyclery, say “hi” to Ridley (pictured at right). And if you’re lucky, you may even see a sweet little schnauzer peek out from under his owner’s desk at The Book Gallery. McKinney even has its own pet treat bakery, the Canine Cookie Company, just a half-block off the downtown square proper. Dogs are always welcome here, since everything sold there is meant for them – healthy homemade dog treats, toys, leashes and collars, and even birthday cakes (available by special order). Click HERE for a video produced by the city’s television station, McKinneyVision, that explores this special downtown business.